With just over 700,000,000 children around-the-world to deliver presents to, Santa’s sleigh will travel a whopping 212,030,000 miles at the speed of 650 miles per second. But that’s not the only fantastic fact associated with Father Christmas – generous festive treats left out by mum and dad on Christmas Eve means that Santa will be offered around 233,000,000 units of alcohol in the space of one night. A survey conducted by Whyte & Mackay that showed 30.5% of people leave a tipple out as a welcome treat, with whisky proving most popular (54.4%), then sherry (24.3%) and in third place milk (14%). Even with his special powers – and presumably magic metabolism – Santa needs to be careful as us ordinary festive revelers, according to Richard Paterson, master blender for Whyte & Mackay whisky, otherwise known as ‘The Nose’ (no relation to Rudolph). Richard has penned ‘Dear Santa’ letter with a difference, designed to keep the ho-ho-ho in the holiday season for jolly old St Nick by making sure that he looks after himself properly and doesn’t over-indulge. Nobody knows how you manage to get around the world in such record time but we do know that if you plan on enjoying a few drams whilst you take a spin around the world, then bring Mrs Santa along for the ride. It’s not fair that she’s hidden away all year, so I’m sure she’d appreciate the change, plus a designated driver is a must to get you home responsibly and safely. After all, you know the saying – the couple that sleighs together, stays together. If you’ve partaken in a wee whisky at the previous address, make sure to drink soft drinks or water next. Swapping alcohol with non-alcoholic options will keep you hydrated and give you a greater ability to stay alert – which I would think is a must when trying to deliver millions of presents to the right addresses. I’m sure little Johnny wouldn’t be best pleased with Malibu Barbie, instead of his longed-for Nerf Alpha Super Soaker gun. Forget the waistband (if pictures of you are to be believed, you might have already done so) and make sure to eat before you hit your sleigh. Scoff as many mince pies as you can along the way – and if in doubt, steal Reindeer’s carrot too. Eating something’s really important because it cuts down on the alcohol absorbed by the body. You must have been a VERY early adopter of Google Maps – how you’ve managed to navigate your way around the world so quickly and precisely for so many years will no doubt remain one of life’s mysteries. With so many places to go, we’re sure you know how important it is to always know exactly where you are but make sure that you have carefully-laid plans (and back-up plans – is there such a thing as a sleigh-taxi service?) for finding your way home safely. Put the sleigh away the next day. We’re sure that after you’ve circumnavigated the globe, the last thing you’ll want to do is go for a drive the next day. But, if you do, be absolutely sure that you’re not still over-the-limit. A good sleep doesn’t necessarily mean that all the alcohol has left your fabulously magic system and for us normal people, it takes the body one hour for every unit of alcohol to leave the body. If in doubt, leave it out. 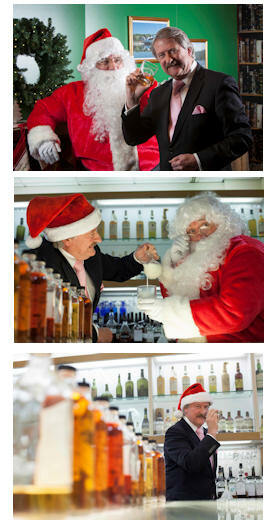 Whyte & Mackay will post additional tips, not just for Santa but also other Christmas party-goers on its Facebook page – www.facebook.com/whyteandmackay.